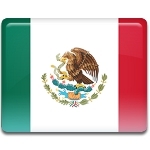 Flag Day in Mexico is a national holiday, that is celebrated annually on February 24. The holiday was established by President of Mexico General Lázaro Cárdenas in 1937. February 24 became the date of the holiday, since Agustin de Iturbide and General Vicente Guerrero proclaimed Plan of Iguala (or Plan of three guarantees) on this day in 1821. Later General Vicente Guerrero became the first person to pledge allegiance to the Mexican flag. This happened on March 12, 1821. Agustin de Iturbide and General Vicente Guerrero's plan was based on three principles: religion, independence and unity. These principles were implemented in three colors of the flag: white, green and red. They were arranged diagonally. Each color banner had an eight-point gold star placed in the middle. This was the first flag of Mexico and it's commonly known as the Pendon Trigarante. Modern Mexican flag is customary saluted by Bellamy salute: arm is held across the chest, palm parallel to the ground and followed by raising of the arm.